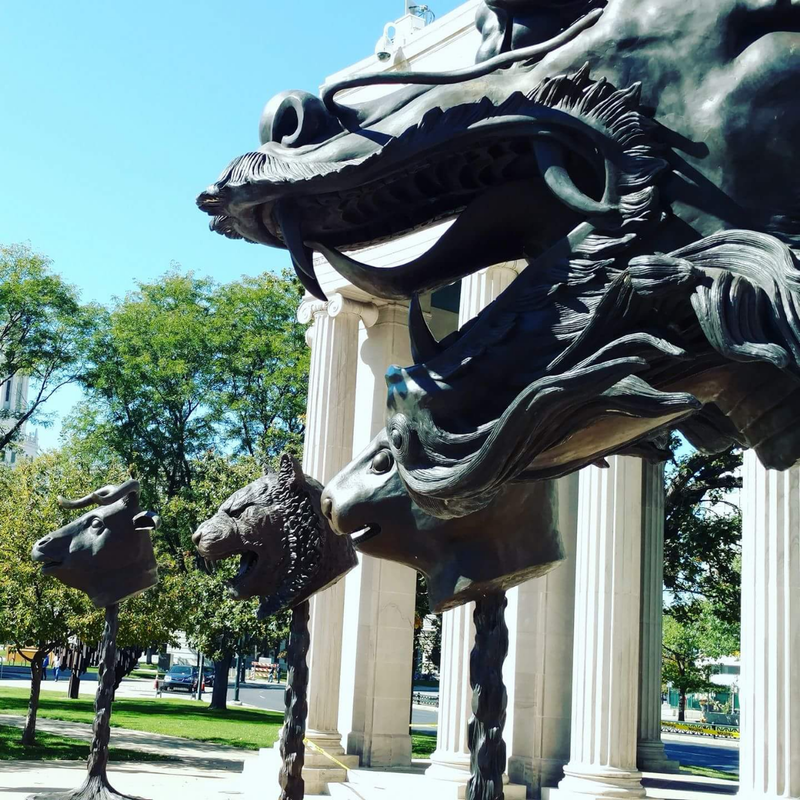 It's hard to miss Ai Weiwei's Circle of Animals/Zodiac Heads, an interpretation of the Chinese zodiac in bronze that's on display in Civic Center Park. Comprised of a dozen expressive animal heads weighing a ton each, the installation surrounds Sea Lion Fountain through October 2018. The October 2017 ribbon-cutting ceremony featured traditional Chinese flute music and several speakers. Nga Vuong-Sandoval, city commissioner for the Denver Asian American Pacific Islander Commission, told her family's story of coming to the U.S. as political refugees from Vietnam: "After losing everything, our culture was the only aspect we were able to bring with us. That's what's important. The Asian zodiac is one of those aspects." Vuong-Sandoval says the event helped connect the city and its Asian community. "It was pretty fantastic," she says. "The installation is the largest Asian art exhibit we've ever hosted in Denver." Nga Vuong-Sandoval at Ai Weiwei's "Circle of Animals/Zodiac Heads." Photo by Kara Pearson. It didn't happen by accident. 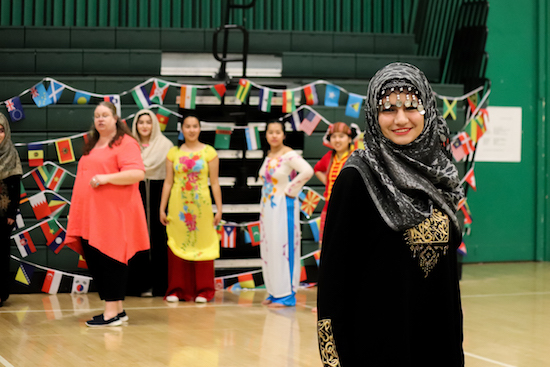 Denver Arts & Venues collaborated with the city's Asian American Pacific Islander Commission to plan the event and bring in culturally relevant elements. "We were grateful to be invited to have a seat at the table at an event that showcases our community," says Vuong-Sandoval. "It was a wonderful step forward." It's been one of many such steps, with the endpoint of IMAGINE 2020, Denver's cultural plan that launched in 2013, just two years away. In the multi-pronged rethinking of the city's approach to arts and culture, diversity and equity are big priorities. Ai Weiwei's animal heads weigh one ton each. Photo provided by Nga Vuong-Sandoval. As Vision 3 in the plan reads, "Strong public will and community leadership have forged an unshakeable commitment to address issues of cultural diversity, accessibility, social equity and barriers to participation as they pertain to the arts and engagement. Arts, culture and creativity serve as both a social equalizer and a mode for authentic expression." "I've been working in this field for over 20 years," says Tariana Navas-Nieves, Denver Arts & Venues' director of cultural affairs. "I have been doing equity work basically my entire professional career." A few years ago, Navas-Nieves started taking a more proactive approach. 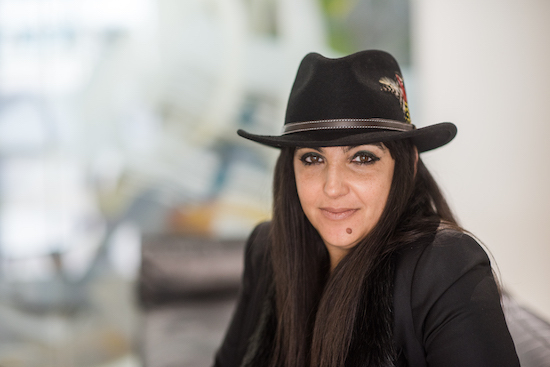 "I felt it was time to not do the work quietly, but to make a public commitment to these values as an arts agency . . . to lead and support others," she says. 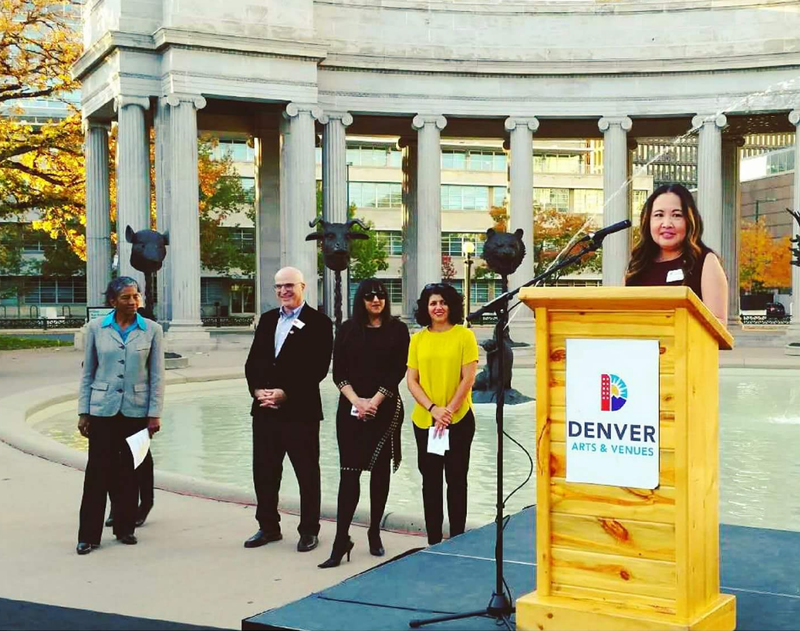 Tariana Navas-Nieves, Denver Arts & Venues' director of cultural affairs said the agency's Diversity, Equity and Inclusiveness Initiative grew from a desire to make sure all communities get a share of city resources.. Photo by Kara Pearson. When Denver Arts & Venues started work on IMAGINE 2020, the public response wasn't coming from a diverse group. "We decided to be much more intentional about it," says Navas-Nieves. The agency's Diversity, Equity and Inclusiveness (DEI) Initiative was one result. The focal point of Navas-Nieves' work on the initiative is integrating inclusiveness into everything the agency touches. Her main question: "How do we embed this DEI lens in our decision making and also to develop our programming?" "It's also about operationalizing our efforts and changing our processes and programs," she adds. "We are reviewing our processes to eliminate the barriers to participation." And the city is putting money where its mouth is: Denver Arts & Venues established a line item for DEI programs in 2017. It's jumping from the inaugural $35,000 to $50,000 for 2018, plus additional funding for signage and other investments at each city venue. Staked with the new funding, Navas-Nieves reached out to the nine commissions under the umbrella of Denver's agency of Human Rights & Community Partnerships to develop community-minded programs with each. "We want to invest money in community building," says Navas-Nieves. "We are bringing the money but asking the commission how they want to evaluate and distribute these funds." In 2017, the Latino Commission and Immigrant & Refugee Commission were guinea pigs for the program's pilot year. Latino Commission members decided to fund a pair of projects in 2017: a flag-making effort at George Washington High School and an exhibit on women's rights and domestic violence for Museo de las Americas in the Art District on Santa Fe. The Immigrant & Refugee Commission funded an exhibit on family histories that is traveling to libraries across the city. 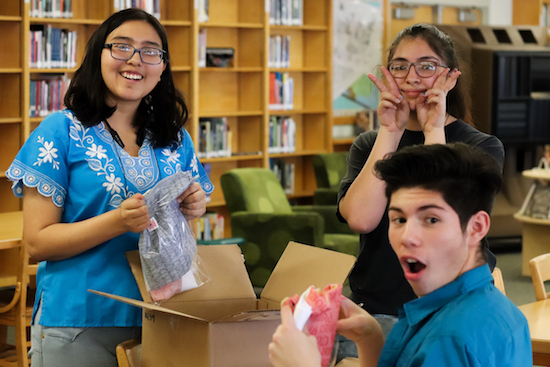 With more than 60 languages spoken by students at George Washington, they are sewing the flags from each relevant nation -- and a new one developed by Native American students -- into a single large flag. Navas-Nieves says all of the pilot projects outdid expectations. "It's been wonderful," she says. "This year, we're going to roll it out with all of the commissions." Each commission will have two $1,000 grants to award in 2018. "It made a huge impact," says José Silva, Navas-Nieves' co-chair of the Latino Commission and an Ed.D candidate at CU Denver. "We know it's only $1,000, but $1,000 can go a long way." The flag project came from a partnership between the city and the Latino Commission and the Immigrant & Refugee Commission, Photo courtesy of Arts & Venues. Silva says the request for proposal for the pilot drew about five applications, but he hopes to cast a broader net in 2018. "We have been having a lot of conversations in the community," he says. "What does equity look like and how do you show that?" Jessica Skibo, chair of the Denver Women's Commission and a financial analyst for the City and County of Denver, says she's looking forward to working with Navas-Nieves as the DEI grant program expands in 2018. With a focus on pay equity and related issues, the Women's Commission has endeavored to broaden the perspective of Denverites since 1985. "We're one of the oldest commissions and we're very active," says Skibo. While progress has been made, there's a need for continued advocacy and education. "What we're trying to break down is implicit bias," says Skibo. "It's not the way it was when out grandparents looked for jobs, when there was a men's help wanted column and a women's help wanted column. We don't have that anymore." Vuong-Sandoval said: "We're taking a stand. We're intentionally celebrating diversity because that's who we are." Photo provided by Nga Vuong-Sandoval. It's human nature to have a bias, she adds, but it's about recognizing it and acting accordingly. "It's trying to push that envelope, no matter who the audience is," says Skibo. Vuong-Sandoval agrees. 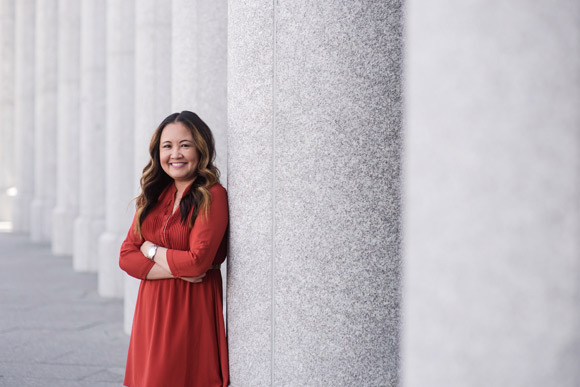 Noting that Asian people have been part of the Denver community since the city's beginnings, she adds, "The city has been built by a real diverse group of people. It's not one or two groups. It should be highlighted constantly to remind people it wasn't one person or one group. It's very layered -- it's more of a mosaic." DEI "is another form of welcoming groups that have not been established," she adds. Making newcomers feel welcome is "not what is happening nationally. We're taking a stand. We're intentionally celebrating diversity because that's who we are." This story is part of a series sponsored by Denver Arts & Venues.